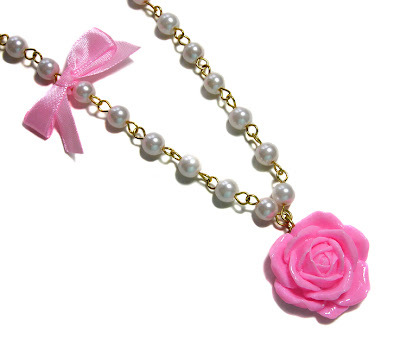 Roses are Pink!- New handmade vintage inspired fun jewellery! I love these Rose cabochons, so sweet and pretty and easy to wear! I've made this pretty necklace from a pink rose cabochon and added glass pearls, brass wire and a pink satin bow of course! For information on where to buy click here. I've also managed to restock the Oui and Non Earrings and Mirror Mirror Necklace so take a look! Wow, this is so pretty. Love the pink.